Players in China are now questioning whether stabilization is possible in China’s local PP market as some sellers have stepped back from their initial hike targets after locally held PP prices reached their highest levels since 2008 in the prior week. 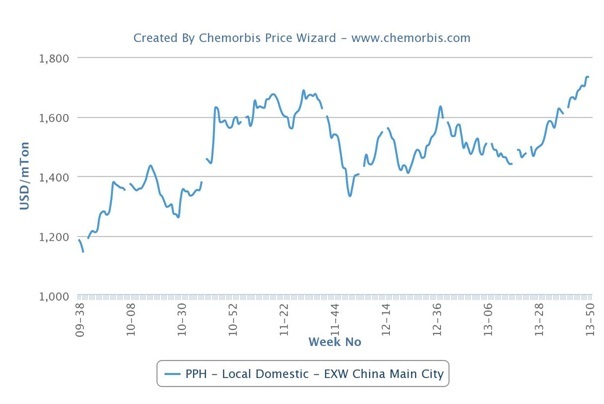 Local PP prices have been persistently moving higher in China since the end of April and have gained almost $300/ton in total, according to ChemOrbis Price Index. The steady gains of more than 6 months appear to have taken a break this week particularly at the high end of the ranges as some sellers have tempered their hike targets and seem more open to discounts on the back of the resistance built on the buyers’ side. 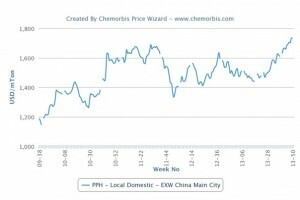 Local homo PP prices are steady to CNY50-100/ton ($8-16/ton) softer on the high end this week. The weekly average is also stable, according to ChemOrbis Price Index. “Sellers are more willing to discuss discounts this week, which may result in some additional step back in prices over the short term. However, we do not expect to see any major movements in prices in the last few weeks of the year,” a source at a domestic producer reported. A trader in Cixi followed suit and agreed to give some discounts in order to conclude deals. “We are not planning to purchase particularly when the end of the year is nearing. Some home-appliances manufacturers shut down their plants due to poor margins and large stocks for end products,” he commented. Another trader in Xiongxian who preferred to keep his offers stable was also open to negotiation and to discuss his prices on a case by case basis as he doesn’t have enough confidence regarding the market outlook, particularly after a domestic producer cut its raffia offers by CNY50/ton ($8/ton) in North China.